Most of the companies getting VC funding generate a small amount of ad revenue, at best. But many get acquired. As far as investors are concerned, these companies are highly profitable, even if they don’t generate revenue. If these startups are highly profitable for their investors, is it really a bubble? It used to be that angel investors wrote off their investments as charitable donations. 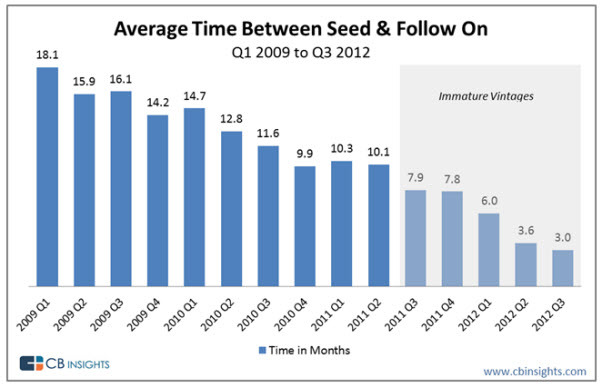 But now, seeded companies are getting their Series A financing in months. The expectation is that Yahoo and Facebook will keep buying these pump-and-dump startups, just like AIG kept buying toxic credit instruments from Goldman Sachs back in 2007.
Who will get burned this time? In 2001, it was the stay-at-home daytraders. But this time, nobody is going to feel sorry for accredited angel investors. So who are the unwashed masses who will ultimately get burned? Maybe it’s the kids who work long hours at crappy seed-stage startups for chump wages and 0.001% equity. Nothing’s cooler than a job at a hot Silicon Valley startup, right? So they work in indentured servitude, hoping to be forever remembered as Employee #X of the Next Google. Crowdfunding for startup investments has only just begun. If the JOBS act goes into effect later this year as expected, even non-accredited investors will be able to put seed money into startups. And sites like Wefunder will be right there to help funnel cash from the masses. If this becomes a reality, then the real bubble can begin!